Medical Qigong is a therapeutic form of qigong that originates about 5000 years ago. It‘s early beginning was purely medical but in its evolution many martial schools and religious group realizing its health benefits had incorporated and adopted it as part of their philosophy and training. Medical Qigong treatment goes back to its original purpose of being solely therapeutic to meet the medical needs of all. It has strict protocol, or methodology of treatment that effectively helps to bring healing and relief to many. The range of illness cannot be listed as no one knows the limits of its healing powers. We have a physical body and an energy body. We live on a giant electromagnetic generating ball call earth. Like pins that are magnetized by magnets on constant contact, everything on earth are also energized. The universe emits this energy force and we are part of this element. This electromagnetic force traditionally called ‘chi' circulates in our bodies as meridians controlling our blood, endocrine, nervous and other body system. 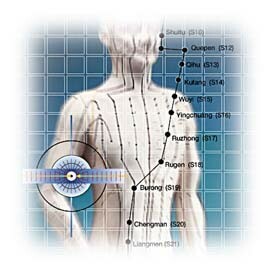 There are 12 meridians that keep these systems in balance and our organs healthy. Disruption or depletion of chi will result in the poor functioning of our organs and body system and results in illness and dysfunction. Medical Qigong treatment procedure is to scan for these and unblock, sweep, reenergize, stabilize and so restore the meridian flow. Certain qigong exercises may also be recommended to help in healing and maintaining the meridian flow. Energy Science Qigong workshops are conducted in the EPC Centre. For futher info see services. After 5000 years development, there are more than 3,000 varieties of qigong and three major qigong traditions, namely medical, religious and martial arts. Qigong has two types of form, "soft" and "hard" qigong. "Soft" qigong is called inner qigong or soft qigong such as Taiji. One sample of hard qigong is the famous Shaolin Gongfu. Wellness and medical qigong are now encouraged by the Chinese government without associations to religious or martial arts teachings. This is the scientific approach to modern qigong for health. It is a soft form of qigong that is static and relaxing and so allows everyone to practice the exercises. Energy Science Qigong takes this path of scientific approach to health as the name implies. Medical qigong involves chi exercises combined with visualizing. The chi exercises will bring one to a state of relaxation. Distress and anxiety will fade away during the exercise. Through the exercise we are able to stimulate and balance the circulation of blood and chi. Exercise is good for patients as well as any age group who would like to maintain good health and a state of peaceful mind. Qigong helps in the treatment of emotional and physical stress. Today, There are estimated more than 70 million Chinese practicing qigong, some for treatment and most as wellness exercise. Qigong lets people experience higher levels of energy and stamina, and slow down the aging process. It increases our immune function and prevents disease. It is also helpful in treating chronic conditions or disabilities. Qigong can help one fight virtually any disease. Through qigong, patients can strengthen inner energy and thus increase the chance to survive from many diseases, which Western doctors considers as untreatable. The West starts to recognize the effectiveness of Qigong and TCM. In 1988 Chinese held the first World Conference for Qigong Medical Research in Beijing and later followed by a series of conferences held in Tokyo, Berkeley and New York City. Psychologists, physiologists and medical researchers have started to study qigong as a new alternative medical approach. Qigong will smooth the process of delivering oxygen to the cells, reduces stress, balance hormone production and improve bowel function. Chinese doctors have applied qigong in hospitals and clinics to treat individuals suffering from a variety of ailments. These include allergies, arthritis, asthma, bowel problems, constipation, diabetes, gastritis, gout, headaches, heart disease and hypertension. The list can go on to chronic kidney disease, liver disease, lower back pain, myopia, obesity, paralysis induced by external injury, retinopathy, rheumatism, sciatic neuralgia, sleeplessness, stress, ulcers, and peripheral vascular disease. Qigong can be used to treat cancer and reduce or eliminate side effects from radiation and chemotherapy. It will help in treating aphasia, cerebral palsy, multiple sclerosis, Parkinson disease and post-stroke syndrome. It is especially useful in treating any kind of chronic pain, and chronic disorders of the digestive, respiratory, cardiovascular and nervous systems. Qigong just like any other exercise has to be taught and trained under the guidance of a certified Chinese medical practitioner. Beginners need professional supervision from certified qigong practitioner who will provide advice and guidance. It requires discipline and persistence to see the result. Scientists are starting to figure out what is going on inside our cells when we sense electrical fields. Reiki, energy healing, yoga, qigong, chi and many other spiritual and healing practices are strongly based on feeling energy flowing through living things. All living cells have electrical fields and many different animals are able to sense and react to electrical fields. Even human cells will move in response to an electric field during wound healing. This led a team of researchers to wonder what was actually going on inside of our cells to detect these energy fields. Min Zhao from the UC Davis Institute for Regenerative Cures has led a team of researchers in discovering the first “sensor mechanism” inside living cells that can detect electric fields. There are more senses in the human body than the traditional five. Scientists are beginning to discover a whole set of electric senses that may explain why some people can feel the flow of energy in other living things. “We believe there are several types of sensing mechanisms, and none of them are known. We now provide experimental evidence to suggest one which has not been even hypothesized before, a two-molecule sensing mechanism,” -Min Zhao said. Zhao and other researchers have been studying “electric senses” in animals in order to pinpoint what causes us to react when we come in contact with another energy field. They have specifically focused their research on both large and small animals. The large animal cells that they have studied are human and fish cells and the small animal cells were amoebas. They found that there are specific genes and proteins that will move in a certain direction when they are exposed to an electric field. Feeling energy or electric fields is actually very common. Have you ever walked into a room and immediately felt that someone was angry? Nothing had to be said for you to tell that someone was upset. The case is the same when people are in love. Often it is clear as day to everyone else when two people feel an attraction to one another. We are constantly picking up on higher senses that we didn’t know we had. Perhaps in the near future scientists will find the exact electrical frequency that we emit when we feel a strong emotion such as love, fear or anger. If this area of science teamed up with psychologists we may be able to understand empaths, sensitives and other people who can feel emotions and even heal others. 2 unique elements were found in our cells that detect electrical energy. It was discovered that 2 elements were needed in order for a living cell to detect the electrical fields. One was a protein called Kir4.2 and the other was a specific type of molecule contained in the cell known as polyamines. Kir4.2 is a type of potassium channel which will create a pathway through a cell membrane that will allow potassium ions to come into the cell. Those ion channels will transmit signals into the cell. Then the polyamines will carry the positively charged molecule into the cell. Our nerves and cells communicate with electrical signals. When you want to move your arm, your brain sends a signal down your nerves and into the muscles telling them to move. On a chemical level when the electrical signal is sent down your nerve all that happens is a line of potassium and sodium change places. One is positively charged and the other is negatively charged and that sends the signal. When your cells come in contact with an electrical field from an electronic source or from another living thing it basically opens up the channels and sends the signals to the cells brain probably because it believes it is being sent instructions from your brain. Meditation and Feeling living things from a distance. Our cells pick up other energy fields and depending on how far they are projected out we may be able to feel them from a distance. So that may explain why you can feel someone who is upset from across the room. The stronger the signal the more likely you will be able to feel it. This may also explain why people talk about feeling the energy in plants or trees when they meditate and spend time in nature. Perhaps meditation is a tool we use to fine tune our ability to sense what is going on within our body. Mindfulness meditation teaches us to become present and to tune into our senses. With practice, we should be able to learn how to feel electrical fields, interpret them and possibly even manipulate the electrical fields for healing and rebalancing emotions. Could our electronics be confusing our senses? If our cells naturally open up and receive signals from electronics it is reasonable to believe that they would absorb the signals from cell phones, televisions, computers, WiFi routers, etc. This new discovery may help explain why we feel drained after spending too much time with electronics. It’s possible that our cells are feeling draining because the entire time you are near an electronic field your cells are receiving signals that aren’t designed for your body. If you were to listen to gibberish all day trying to figure out what to do it may become a bit exhausting after a while. That is what is happening to your cells. As we continue to discover how our cells react to electronics and their energy fields we may have to make some major changes in order to protect our cells from over exposure. Of course, that may just look like spending more time out in nature connecting with healthy electronic fields instead of spending the majority of our time inside in front of a glowing screen. What do you feel that this discovery will do for the field of energy healing, meditation, qigong, and electronics? Let us know your thoughts in the comments below. University of California – Davis. “Sixth sense: How do we sense electric fields?.” ScienceDaily. ScienceDaily, 13 October 2015. Copyrighted © 2014 | Energy Psychology Centre| www.qigong.eftwonder.com | All Rights Reserved.